Q: What is nutritional yeast and what are some of the nutritional benefits? A: Nutritional yeast has long been considered a healthy dietary supplement because it’s both low in calories and carbs, and high in protein. It's often used as a cheese replacement in dairy-free recipes because it has a naturally cheesy, nutty, savory taste. Nutritional yeast also contains iron, fiber, folic acid (non-methylated form), selenium, zinc and B vitamins, including vitamin B12. The B vitamins are the synthetic forms with the exception of natural B12. Many people who avoid meat add nutritional yeast to their diet for B12 supplementation. Nutritional yeast is fortified and naturally gluten-free. It is not derived from gluten, nor does it contain gluten. It is Kosher, Vegan and Non-GMO. A: Yes, our dressings are manufactured in a shared facility and on a shared line with other products that contain most the 8 major allergens, however, our products are on a set schedule, and are run in order from Vinaigrette to Creamy dressings. They do clean equipment and do allergen testing in-between runs. If anything is detected then it is cleaned down again. A: Despite being sold in the same aisle in your local grocery store, eggs are Not dairy. Dairy is a product of the mammary gland of mammals, so basically milk and anything made from milk. Eggs come from poultry, which is not a milk producing animal. Eggs are just eggs! Q: What are coconut aminos? A: Coconut aminos are a gluten-free, soy-free combination of aged coconut sap and sea salt that tastes similar to soy sauce. 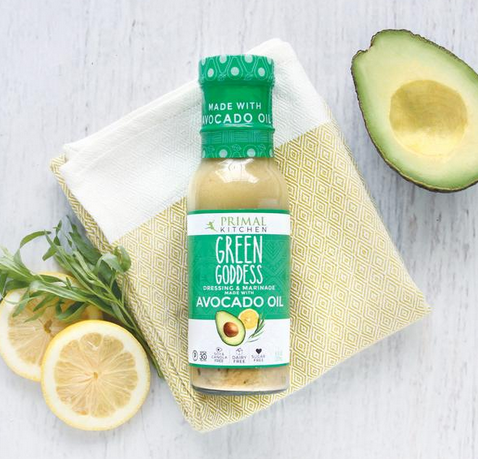 Mixed with the other ingredients in Primal Kitchen’s Green Goddess, this ingredient adds a slightly sweet and salty taste to give our dressings an extra zip of flavor. Q: What is gum acacia? A: Gum acacia, also known as gum arabic, is derived from the sap of the acacia tree. It was once used by ancient Egyptian civilizations to treat a variety of medical conditions such as healing wounds, sore throats and addressing digestive issues. Today, it’s used in products, such as our Green Goddess Dressing, to keep the emulsion together, or you can find it in capsule or powder form in the aisles of most health food stores. Q: What is the shelf life of your Green Goddess Dressing?